Who Is a Good Candidate for a Mouth Guard? The team at PQ Family Dentistry believes in comprehensive general, cosmetic, and restorative dental treatments. We've built a strong reputation in the Rancho Penasquitos area for enhancing health while promoting wellness through preventative care and patient education. For some of our patients, a mouth guard may be just what they need. Some people may not know what a mouth guard is and what it can do. Let's take a moment to cover some of the basics and discuss who may be a candidate. A mouth guard is a protective retainer that can be worn for a variety of reasons. The guard is made of durable materials, to ensure that the teeth, gums, and other structures of the mouth are properly protected at all times. There are different reasons for people to wear mouth guards. Below are some of the most common candidates for having mouth guards placed. In contact sports and combat sports, there's a high risk of serious injury to your teeth, gums, and other structures of your mouth. This is a major risk in particular for people who participate in contact sports (such as football and hockey) as well as combat sports (such as boxing and mixed martial arts). Even in non-contact sports such as basketball and soccer, there is a chance that a sports injury could result in serious harm to the face or chin. Mouth guards can help protect the teeth from chips and cracks, and can also protect the tongue from serious injuries. A protective retainer is ideal for athletes of all levels, from professionals and students to semi-pros and weekend warriors. Teeth grinding refers to the gnashing, clenching, and shifting of the teeth when you are asleep. This can be caused by a number of issues, such as tooth misalignment, excessive stress, and use of certain medications. Treating teeth grinding typically involves a combination of therapies to help address the root problem you are facing. One of the key treatment options for teeth grinding is the use of a type of mouth guard known as a night guard. This helps prevent direct contact between the upper teeth and the lower teeth, reducing stress and protecting your teeth from harm in the process. TMJ disorders refer to a problem with your jaw joint. The telltale signs of this problem are the locking, popping, and clicking of your jaw. Some people also notice pain and a strange slipping or grinding sensation in the jaw. To restore joint function and comfort, dental therapy is required. One of the potential causes of TMJ disorders is teeth grinding. 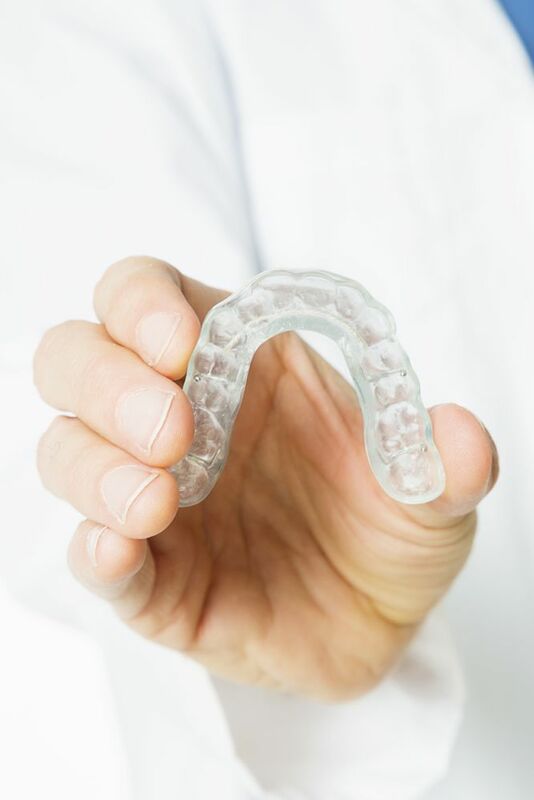 To help alleviate some of the stress on the jaw, a mouth guard may be created to to be worn at night. Additional therapies can then be performed to improve overall dental health and wellness. It's a good idea to have a custom mouth guard made rather than buying the retainers and guards that you can find at some sporting goods stores. A custom retainer is far more comfortable for your mouth. Your dentist and the dental lab that crafts the mouth guard will take great care to ensure that comfort as well as overall effectiveness of use are emphasized. If you would like more information about mouth guards and how they can help you have a healthy smile, be sure to contact our cosmetic and restorative dentistry center today. The team at PQ Family Dentistry is here to answer your questions and address your concerns.